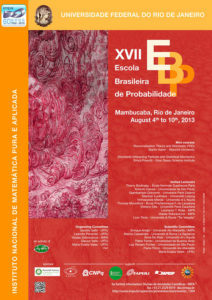 The Brazilian School of Probability (EBP) has been organized each year since 1997 by initiative of the Brazilian probabilistic community and planned as a forum for the discussion of new ideas and developments in Probability and related areas. It is an opportunity to detect new research directions and to establish new collaborations, and an excellent occasion for students to start their scientific life. The EBP has been organized by IMPA, IME-USP, IMECC-UNICAMP, UFMG and by UFPE, with the participation of IM-AGIMB and INCTMat, and has received support of several scientific societies and research agencies. 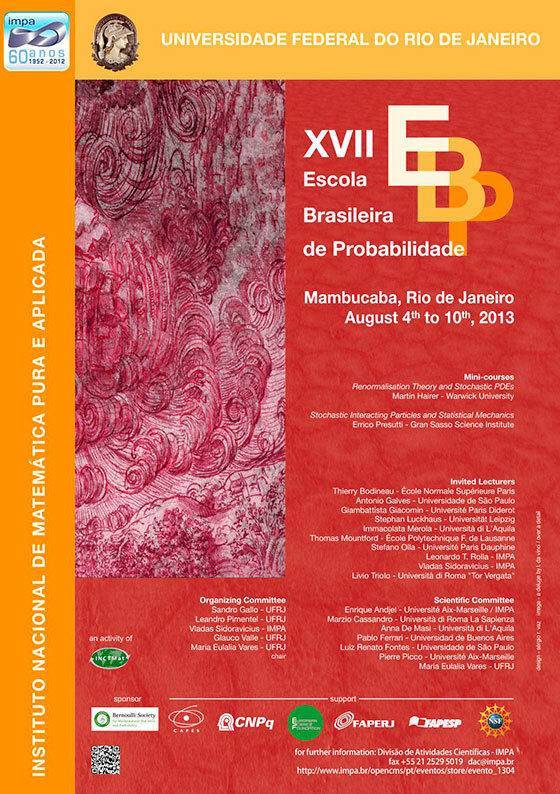 The 17th edition of the Brazilian School of Probability (XVII EBP) will be organized by IMPA and IM-UFRJ. At this occasion we shall celebrate more than thirty years of friendship and scientific interaction between the group of mathematical physics and probability of Roma and L’Aquila and our group of probability in Brazil. The event will be held in Mambucaba, Rio de Janeiro, from August 4 to August 10, 2013. During the 17th edition of the Brazilian School of Probability, the organizers have announced their wish of having a special volume related to this meeting. We can now make its official announcement and call for papers. The XVII EBP celebrated a long standing friendship and scientific interaction between the group of mathematical physics and probability of Roma and L’Aquila and our probability group in Brazil. Since the beginning, a central role in this interaction has been played by Errico Presutti, whose leadership, determination, and generosity in promoting the discussion of various ideas has been crucial for the scientific lives of many of us, and for the development of these groups. It is for us reason of big joy and happiness that he has accepted to have this volume in his honor. We shall do our best to correspond. The special volume will be published at the Brazilian Journal of Probability and Statistics, having Enza Orlandi (Roma Tre), Glauco Valle (UFRJ), Maria E. Vares (UFRJ) as guest editors. The guest editors thank the collaboration and support of Nancy Garcia (Unicamp), editor-in-chief of BJPS. Deadline for submissions: March 10, 2014. Papers should be submitted by the electronic system of the journal (EJMS), under the ‘special volume’ flag (to be created shortly). The indication of the special volume is needed to have your paper considered for this specific number of the journal. To be sure, you might also send an email message to the guest editors (orlandi@mat.uniroma3.it, eulalia@im.ufrj.br, glauco.valle@im.ufrj.br) informing about your submission. The articles should be of the highest quality, and all texts will be peer refereed. Renormalisation Theory and Stochastic PDEs. Stochastic Interacting Particles and Statistical Mechanics. An analysis of some stochastic models of biological interest. Participants must be registered in order to submit a communication. All submissions appear as ‘poster’. The number of short talks is limited and the selection will be done by the organizers. To submit a communication, the participant needs to prepare an abstract in LaTeX using the standard format of the school which can be downloaded by clicking here. The text must be processed directly from LaTex to the .PDF format. The .PDF and .tex files should be sent to the e-mail ebp17@im.ufrj.br not later than May 31, 2013. Other lodging options are available at the Vila Historica de Mambucaba. We describe next these options. a) Vila Historica de Mambucaba: Located 2 km from Hotel del Bosque, it is a small beach town (about 500 inhabitants), whose central section was built in the colonial period, and includes a very pretty XVIII century baroque church. The two inns described below are at less than 100 m from the beach. On leaving the airport we suggest that you take a taxi. The yellow cabs are less expensive than the special red or blue ones, as these have special booths located inside the airport facilities. The current fares are around R$ 60,00, for a trip of about 30 minutes. There are also air-conditioned buses leaving from the blue sector, terminal 1 and 2, running from the airport to the Novo Rio Bus Station, Copacabana, Ipanema and Leblon. There are two bus lines running near the Institute: line 409 (Tijuca – Jardim Botânico) and line 124 (Central – Jardim Botânico). Pay as you enter, using the front door to get on and the rear door to get off the bus. The current bus fare is R$ 2,75 and the maximum change given is for a R$ 20,00 bill. For those who will arrive at IMPA much earlier than the Bus departure, room # 224 will be available to leave your luggage. At the same floor you may find restrooms. Once at IMPA, you can go for a walk at the Botanical Garden http://www.jbrj.gov.br/ (Rua Pacheco Leão 100) in order to wait for the Bus departure (15:00). There is also a very nice restaurant, Couve Flor http://www.couveflor.com.br/ Rua Pacheco Leão 724. The Costa Verde bus line company is another transportation option to go to Mambucaba. Those who can not take the transportation provided by the event should take bus a Novo Rio Station located at Av. Francisco Bicalho, nº 1 Santo Cristo in the downtown. There are many departures times available and the fare is R$ 59,00. You have to ask the driver that you have to get off the bus at Hotel dos Bosque – PEREQUÊ. Those interested in using this transportation, shall send an e-mail message to dac@impa.br informing the name, ID number, RNE or passport (for foreign). Place: São Paulo – (Campus USP, Butantã — in front of Escola de Educação Física, next to Portaria 1 of the Campus). The bus will pass by Guarulhos Airport in case there is interest (around 2:45PM on the way to the School; and also on the way back on August 10, without an estimate of the schedule for the moment). Those interested in using this transportation, shall send an e-mail message to secproj@ime.usp.br (Regiane e Marilúcia), with subject “Ônibus EBP”, informing the complete name, ID number, RNE or passport (for foreign). Time: * Information will be available later/soon. Mambucaba is located in the so called Costa Verde (Green Coast) in the South West of Rio de Janeiro State, near the boundary with Sao Paulo State. In this region the Sierra do Mar mountain range meets the see, and all the mountain slopes are covered by a luxuriant vegetation, part of one of the few extant large extensions of subtropical forest (Mata Atlântica) in the country. The weather is humid and tropical. The meeting will take place in winter, which is relatively drier, but participants should be prepared for some rain. Daily temperatures in July fluctuate between 22 and 32 degrees Celsius (72 and 90 degrees Farenheit), but night lows can go down to 15 Celsius (59 degrees Farenheit). The organization of the School has a limited number of fellowships for young researchers and students, and special support for european researchers (reimbursement from ESF). The deadline to apply for financial support is May 31, 2013 , with answers to be out by July 10, 2013. All applicants* should fill in the registration form. *) Students applying for financial support should also submit short Curriculum Vitae and two recommendation letters from professors familiar with them. Letters should be sent directly by recommender to ebp17@im.ufrj.br using 17EBP: (last name of applicant) in the subject line. Participants from Latin America are encouraged to ask travel support to the Union Matematica de America Latina y el Caribe. Please contact directly UMALCA. Researchers with PhD affiliated to institutions of the state of São Paulo (permanently or temporarily) should send a message to L.R. Fontes (lrenato@ime.usp.br) in order to enter the collective request of funds to FAPESP for the school. For that a (prospective or definitive) title and abstract of work to be presented at the school should accompany the message. Deadline: April 14 2013. Payment of registration fee will be made upon arrival, in Brazilian currency (Real) and check.